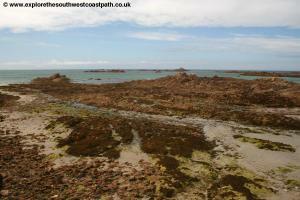 This walk takes in the west coast of Guernsey. Beginning from Torteval the walk takes in the rocky south west coast of the island. 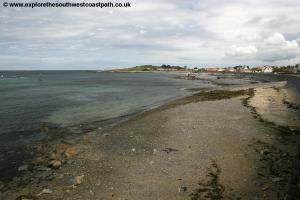 Soon the coast becomes flatter as you round Rocquaine Bay to reach the north west coast of the island where you can take the causeway out to Lihou Island, tide permitting. 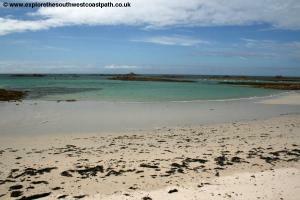 The walk continues east along the north coast of the island past some glorious sandy beaches to end at Grades Rocques. 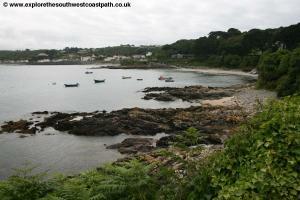 This walk begins from Le Creux Mahie on the south coast of the island. This is on Route de Pleinmont. Just by the airport, turn left along La Rue De La Villiaze and follow this to pass Torteval stores at a sharp turn in the road. The nearest car park is a short distance west of here, so just after the stores turn left along the minor road passing a few houses and then leading to a small cliff top car park. If you are coming by public transport bus numbers 7 and 7A provide a regular service from St Peter Port and the Airport. Alight at Torteval Stores which is on a sharp bend in the road on Route de Pleinmont. Ask the driver if you are not sure where to get off. To reach the coast from the bus stop if you've come from the airport after getting off the bus turn in the direction you have come from (south) and take the minor road that forks off to the right. As you come to a house, take the track to the left of the house and as this ends continue straight ahead on the footpath to reach the coast path at Le Creux Mahie. For details of the bus times see Buses.gg. 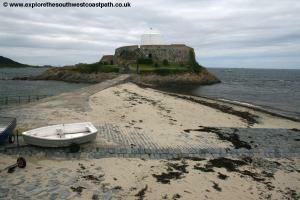 There is a wide variety of accommodation in Guernsey from luxury hotels to self catering cottages to campsites. 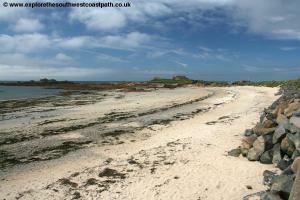 Visit Guernsey - Accommodation is a comprehensive directory of accommodation on Guernsey, Alderney, Herm and Sark. 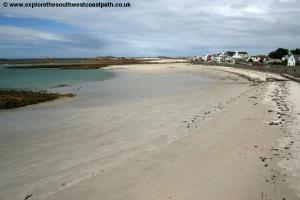 As the island is small most visitors are likely to remain at the same accommodation. 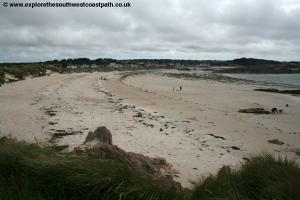 However the The Imperial Hotel is on Rocquaine Bay a few miles into the walk or the The Wayside Cheer Hotel is close to the end of the walk at Grandes Rocques. From the coast at Le Creux Mahie head west along the coast path descending into the little valley and back up the other side. 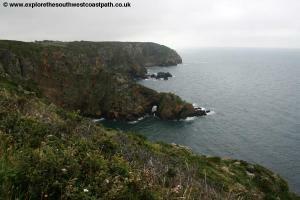 At Les Tielles there is a dead-end path out to the end of the headland but the main path continues west along the cliff top. 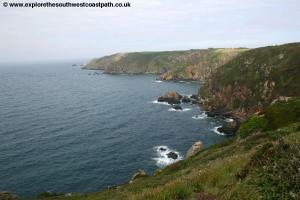 Continue past the small car park at Les Tielles (which is the nearest car park to the start of the walk) and continue on the cliff path with fields to the right. 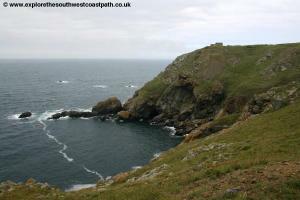 You round the back of a little shingle beach and looking back there is a small cave in the cliffs of this spectacular rocky part of the coast. 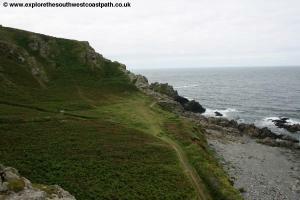 At the west end of the bay the path climbs and continues right on the cliff top. 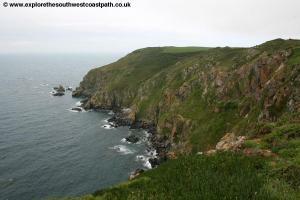 Soon the coast path joins a track and at a junction ahead fork left on the minor road and as the road ends continue west on the cliff top path. Descend down and back up a small valley and continue to the German built observation tower at Mount Herault. Continue on the coast path west to another car park Go through this and continue on the coast path on the other side soon passing a restored World War II gun. 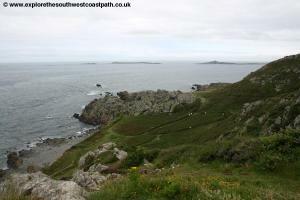 Continue past another small car park as the path now begins to head north around the south west tip of the island. 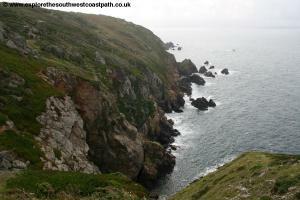 You pass Pleinmont Point, the most westerly point of the island where the car park reaches another car park. Here follow the track straight ahead through the car park and when you can fork left on the path down over the common land to Pezeries Point. 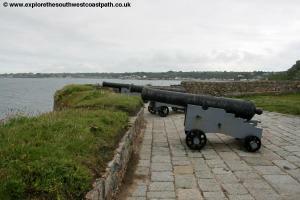 Descend down over the rocky area to the large car park where you reach Pezeries Fort. This fort is accessible to the public and has a commanding view of the west coast of the island overlooking Rocquaine Bay and L'Eree Bay. 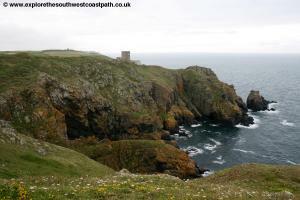 Here the character of the coast has changed a little with the high rocky cliffs giving way to lower cliffs and woodland. 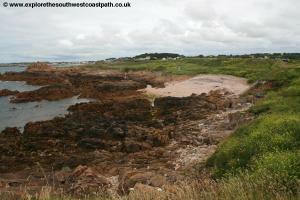 You now follow this minor road around Le Varde to Portelet Harbour. Beyond Portelete Harbour is a sand and rocky beach and soon you reach the Imperial Hotel at the south end of Rocquaine Bay. 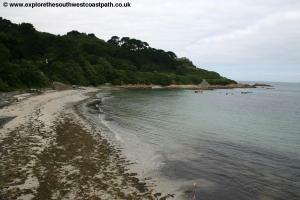 Sadly here the coast path ends and you must continue on the now fairly busy road along the back of the beach, so care is needed. Follow the road around the back of the beach soon reaching Fort Grey, a small fort located just offshore via a causeway which houses a shipwreck museum. 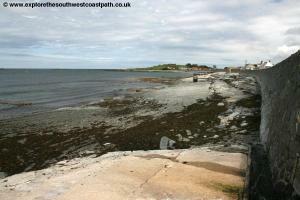 Continue north from here still on the road although if the tide is out you may prefer to follow the beach instead. 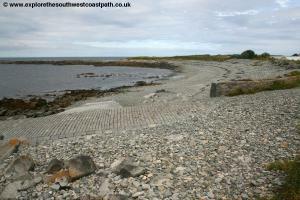 There is a large slipway roughly halfway along the beach which soon changes name from Rocquaine Bay to L'Eree bay. Pass the main car park at L'Eree Bay and the L'Eree Bay Hotel. 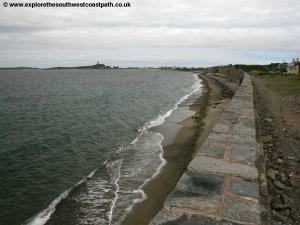 Here you heave reached the north east corner of the island. Continue on the road ahead from the north end of the beach, the minor one-way road to the left. 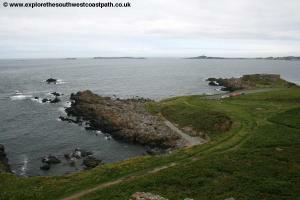 This leads out to the car park and the causeway to Lihou Island. 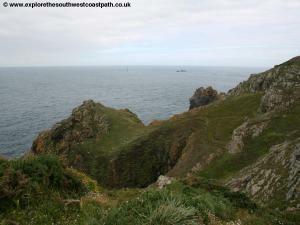 The island has a large tidal range (in common with the other channel islands) and as such you must observe the safe crossing times which should be posted at the slipway here. 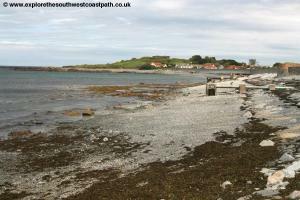 If you are within those crossing times you can cross over to Lihou Island and explore the island although it is worth noting that on some days there are no safe crossing times and it should not be attempted in rough seas. 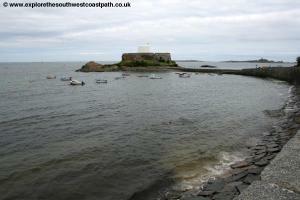 If you are in luch and the causeway is open the island is worth an explore. 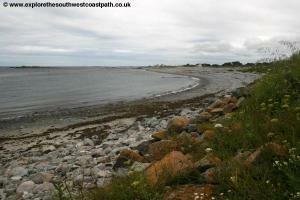 It is a bird sanctuary and has the remains of a 12th century priory. 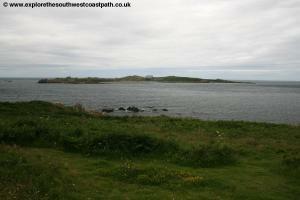 Also on this headland you will find Le Creux es Faies Passage Tomb, a well preserved burial chamber. 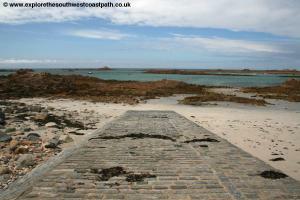 From the slipway to Lihou Island return to the road and car park and continue along this one-way road around the back of the old German World War II tower here which has now been converted to a private house. 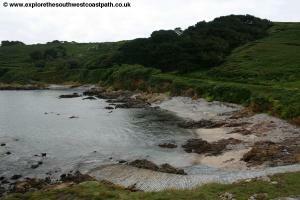 Soon you reach the rock and shingle beach of Les Anguillieres. From the car park there is a small path adjacent to the road to give a break from the road walking although as you near the north end of the beach and Haute Banque you rejoin the road. 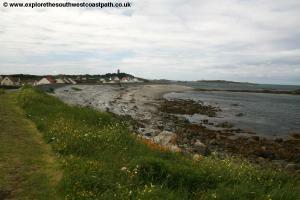 At the north end of this beach a rocky causeway leads out to La Capelle, a small rocky island. 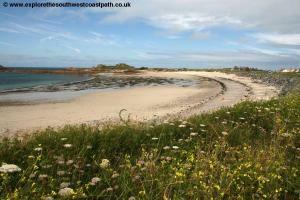 Continue on the road at the back of the beach here to the car park at Le Catioroc and on to Perelle Bay. 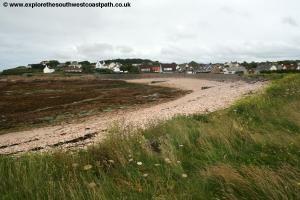 This is a mostly rocky beach with some sand at low tide. 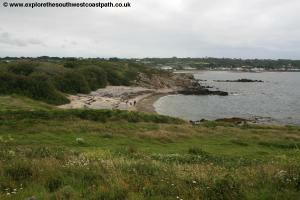 You follow the beach north to the headland at Fort Richmond. 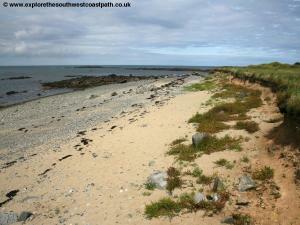 There isn't a path around this headland so here, by the slipway, join the road heading east. 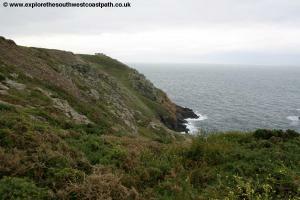 There is a minor road which heads north to end of the headland although it is a dead end. 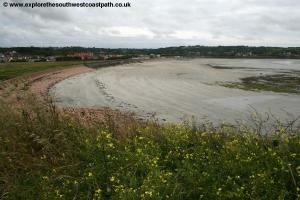 To continue on the coas tpath keep with the main road until the car park at the western end of Vazon Bay. 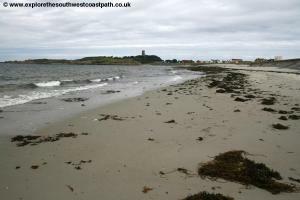 Vazon Bay is a good sandy beach, one of the largest on the island although sand is limited at high tide as the sea often reaches the sea wall. 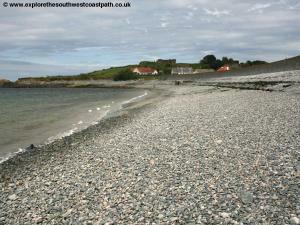 Follow the road along the back of the beach or the path adjacent to it, or if the tide is out you may prefer to walk along the beach itself. 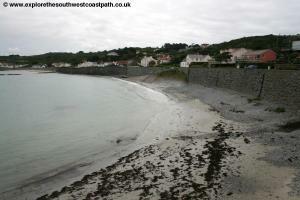 At the north end of the beach you come to Albecq and Fort Hommet. 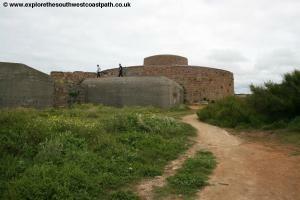 This is another interesting fort which you can explore. 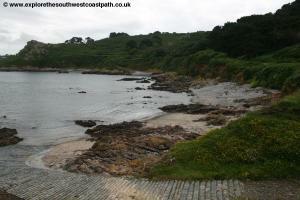 The coast path continues around this headland past the fort and then re-joins the road at Albecq, a small rocky beach. 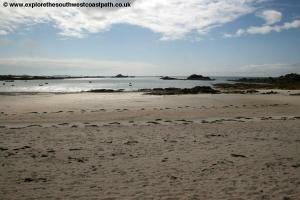 Round the beach along the road to reach the next large beach of Cobo Bay. 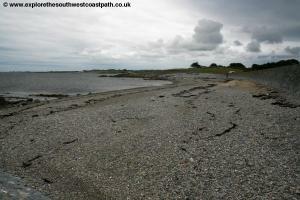 This is a wonderful beach with a mixture of sand and rocks again backed by the road. 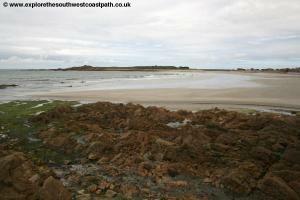 Follow this beach to it's northern end, which becomes Saline Bay (or Grandes Rocques Bay). 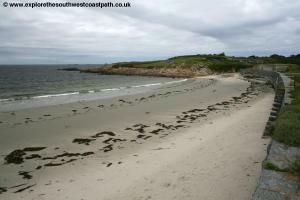 At the car park at the north end of the beach (which also has toilets) the walk ends. From the car park at Saline Bay (Grandes Rocques) bus service 7A runs back to Torteval village stores at every 30 minutes Monday – Saturday (at least) and hourly on Sundays, a journey of around 20 minutes. In addition from here bus services 3 and 3A run direct back to St Peter Port or service 7 runs clockwise around the coast back to St Peter Port. Here are some photos of the walk. Click each image for a larger version.